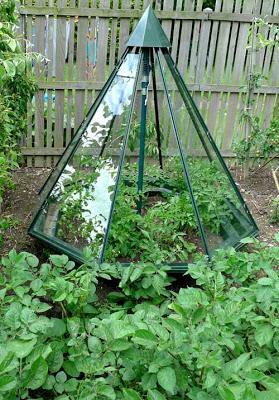 We have a Growmate pyramid greenhouse like the one below. The glazed section lifts and rotates above the base and one section of glass lifts out to allow access to tend the stuff growing inside. Unfortunately, Mrs NSS is no longer able to get down on her knees (or get up again if she does) so I want to raise the whole thing up to a suitable height. That would of course be relatively easy, but I would actually like to make it so the whole thing, base and all, can easily rotate too, thus allowing her to sit in one position and turn it as needed to access each segment. Effectively, it needs to sit on a large 'Lazy Susan', but one which will cope with a total weight of perhaps 150 to 200kgs. Any ideas as to what I could use without having to spend a small fortune? Cheers Jeremy, but as mentioned I estimate loading to be 150-200kgs. Found this https://www.sdslondon.co.uk/furniture-turntables/turntable-360-degree-450-kg.html?campaign=196461189&amp;content=193655401383&amp;keyword=&amp;gclid=EAIaIQobChMI8syJio2d3gIViLHtCh3HKgbaEAQYAyABEgIq__D_BwE&amp;gclsrc=aw.ds but not sure how durable it would be for outside use. Looks ideal, especially with that high load rating. Probably a good idea to liberally grease it when fitting, although it shouldn't get wet under a disc of ply. Just need to make some sort of pedestal to raise the whole thing up to a good working height. A Roballo slewing bearing is what you want. Let me make some enquiries and see if I can get one off a mate. I have seen them used either rubber side down or rubber up. With a channel track to keep the wheels in position. I did consider this, much like a microwave turntable, but thought it might end up being a bit cumbersome. It needs to be something that will move relatively freely or Mrs NSS simply won't be able to turn it from a seated position. with the kind of weight you're talking about, will she be able to able to get the thing to start moving, even on a near-frictionless bearing? Not cheap. Trying a few old mates to see if they have one. About 18" - 2 ' diameter the ones I'm thinking of. There are fabricated versions using a central, bearinged shaft etc. You'd still need "outrigger" casters at the near edge of the structure. Why not just get a bigger, "proper" walk in greenhouse? Yes I know, less fun. Yep, 18-24" would be ideal. I've also found these https://nbcgroup.co.uk/products/trailer-rings/trailer-rings-series-u but suspect they may be more difficult to turn.